The Paradise 60 was designed and built for the ultimate cruising and liveaboard comfort for a couple to sail in the utmost of security. In terms of the accommodations it is easy to see that the guiding requirement of Safety First, Last and Always was built into the interior starting with the construction and seaworthy attributes that include the watertight compartments, double bottom hull design, aluminum construction, and attention to all the systems to keep the boat and crew safe. Knowing all this is a comfort to the owners and crew. The pilot house design feature is an incredible safety feature and is completely watertight. Not only is the visibility, steering, and instrumentation all available where you want it, but also the helm seat literally supports your every move. The adjacent settee is long enough to lie down and nap for your co-pilot. In adverse conditions the boat can be sailed in the complete safety of the pilot house. Throughout the entire vessel you will see that safety is designed right into the layout, the furniture, hand holds, non-skid flooring, and into the galley and the head also. Safety first and always is considered everything above deck and in the cockpit as well as down below. As you enter the companionway, you are in the pilot house with the amazing helm station to port and the settee berth to starboard with wrap around visibility and all the navigation and communication and engine controls at your figure tips. Even the gimbaled helm seat is designed to relax the helmsperson and allow for changing positions and even reclining. There is ample ventilation in the pilot house with air conditioning and three hatches as well as rear portlights that you can lift out or open for a flow of air. The focus on ventilation is not forgotten below deck where there are six large dorades, five flush deck hatches, and ten opening ports and of course air conditioning and eleven fans as well. The hatches are designed so that they can be open at anchor in the tropics where it could rain at any time. Two more steps down from the pilothouse, you have a lovely cabin to port which is a superb sleeping cabin on a passage with an ample single berth and locker and drawers. The head to starboard has a stall shower, toilet, vanity and sink as well as storage. The watertight door to the engine compartment is through the aft head. Just forward of the bulkhead is the large navigation station to starboard with a lovely sleeping berth just aft. The secure U shaped galley is adjacent the nav station to to port. It is designed to be safe and secure in a seaway to insure the crew remains well fed! During the interior design and build a great deal of attention was given to making the boat a beautiful yacht with all the ambiance you would expect for a sailing yacht of this caliber. The furniture has rounded edges and corners so there is nothing sharp. You would never realize the furniture is built for strength but also lightness. You will notice that like the Dashew designs the weight is kept low and there is a wonderful spaciousness. There are convenient handholds everywhere you need them. There counters and table have high fiddles so nothing slides off. Attention was given to designing a pleasing comfortable visual space with a carefully selected blend of wood, fabric, and light colored surfaces as well as keeping the weight low and well distributed. Much attention was given to the lighting as well as the ventilation. The hull windows allow you to see out and enjoy the world around you. The main salon has a beautiful dinette to port that seats six easily and a straight setting to starboard forward of the nav station. Forward of the main watertight bulkhead is the owners’ master stateroom with ensuite head and stall shower. The berth is a large double berth on the centerline. There are plenty of lockers and drawers. The ensuite head has all the features including hand holds and a forward facing Vacuflush electric toilet and of course a stall shower that drains to gray water tankage on any tack. The intention in the design is for this vessel to be the absolute perfect voyager for a couple there is room to have guests, extra crew on a passage. In fact, you can sleep eight by also using the settee in the dinette. There are three dedicated berths including one large single berth in the aft cabin, a large double in the master cabin, a sleeping berth to starboard at the nav station, the sleeping berth in the pilothouse and the dinette settee. This truly is an amazing and thoughtfully designed vessel and if you are a sailor, you will appreciate everything about this yacht. Two 12v air conditioning compressors can run without the generator to cool the master suite and the engine room! Eberspacher radiant diesel heat (liquid filled) the best kind! Dinghy stowage in a brilliant stern locker (garage)! The galley is extremely important on a vessel designed to live aboard and sail far. There must be room for all the galley ware and ship stores as well as all the modern appliances and equipment including reliable efficient refrigeration with a separate freezer, a safe stove and oven preferably with a broiler, a microwave and filtered and refrigerated water are really nice to have. In addition the galley must be designed to be safe in a seaway. As you can imagine Morning Star’s galley is well thought out and well executed. The layout litter surrounds the cook with counters and cabinets to brace against. There are 27 sq. ft. (2.51 m2) of Corian counters fiddles four inches high so nothing can slide off. The lockers that are located above the counter tops outboard are set back and just above waist height. The lockers are modern and they are designed similar to the overhead baggage lockers on a modern plane. They are deep enough to keep the contents in place on either tack and even beating to weather and they are still easily accessible. An electric cooker was chosen for this vessel because it is deemed to be the safest type of stove. Although it sounds strange in the US, this type of stove is very popular in Europe and also most often selected on large yachts. There is no worry about propane on the boat! It is a three-burner Force 10 stove with an oven and broiler with fiddles to hold pots on the burner. The position of the stove amid ship allows you to cook safely without even gimbaling the stove. The layout of the galley allows the cooks to brace themselves securely on either tack. Of course there is a microwave also which is great to have in the tropics. And the electric kettle and toaster are also a wonderful thing on every vessel. The Sea Frost 12 volt refrigeration system uses thin holding plates in the separately controlled refrigerator and freezer compartments which are extremely well insulated. Both compartments have top opening lids and the aft facing front opening doors to make it easy for the cook to get to the food on either tack. And NO propane system! All Electric and Diesel. With total water capacity almost 200 gallons comprised of 160 gallons of fresh water in integral epoxy coated tanks, plus the 20 gallon day tank, and the 15 gallons in the hot water heater plus the beautiful Spectra water maker installed in the mechanical space makes about 1000 gallons in a day, you are all set. Even with two heads with fresh water flush systems will never run you low of water. Even on laundry day! There is a full sized washer and dryer so it is not difficult. The water tanks are lined with epoxy inside and welded and into the hull creating a double bottom and keeping the weight low and in the middle as well. The plumbing and sanitation design is thoughtful with two holding tanks with the aft holding tank located in the mechanical space and the forward holding tank located in the storage area forward of the watertight bulkhead. It’s brilliant since an odor would not be in the living space. There are two gray water-collecting lines from the shower sumps. The plumbing lines have a constant drop toward the keel sump where they are connected to high capacity pumps. Also all the pumps are the same for gray water, bilge water, and black water so as to simplify the spare part and service list. Spectra water maker makes about 1000 gallons in a day! Full sized Miele washer and dryer beautifully installed. The design of the Paradise 60 Morning Star center on Safety First, Last and Always. The navigation system and electronics are no exception. There is an emphasis on redundancy and preparation for all conditions. The pilot house is designed to make it possible to drive the boat and steer from inside in all conditions. It is designed to be comfortable, well ventilated with temperature control and giving the helmsman complete control of the steering and the engine. The aft cockpit with dual carbon fiber wheels is very nice on a nice day, but when it gets inclimate the inside steering station is the place you’ll want to be. Of course there is a magnificent navigation station and ships office down below adjacent the galley and near the companionway. The chart table is large enough for an ocean chart since that is what Morning Star is designed to do! The mechanical space on the Paradise 60 Morning Star is designed to be the ultimate engine room with large amounts of machinery space so that all of the equipment is accessible and maintainable. The dedicated mechanical space encompasses the entire aft section of the vessel and has two hatches. It is accessed through a water tight door. What happens in the engine room, stays in the engine room. That means that all the heat and smells, noise, tools and supplies stay in the engine room. If ever it came to a repower, the engines can be removed easily through an opening the above cockpit seats. All of the machinery is installed in the mechanical space. The mechanical space has a fixed workbench with a vice. There is incredible well organized and accessible storage. There is a full sized tool box that will make any mechanic very jealous, even if they live on land! Also there are two 5K btu air conditioning compressors that cool the man cave space so you can stay as long as need be. In addition there is a sea chest to minimize the number of thru hulls. There are no thru hulls in the two midship water tight compartments of the boat. All the gray water is routed to the deep sump to be pumped overboard. The power plant in the engine room includes the twin Perkins M65 engines. They are light and small, easy to maintain, and they are very efficient. In light conditions you can run on one engine alone and increase your fuel range substantially. Two engines with the twin balanced spade rudders makes it really easy to maneuver. The steering system on any vessel is essential for safety and the Paradise 60 is designed with steering as a foremost consideration. Redundancy is built into the design and even the waterline length was specified for the benefit of steering. The hull shape and rig contribute as well as the weight distribution. The design uses two robust carbon fiber rudders with rudder posts that are 5.5 inches thick. With two rudders there is always good deep contact with the water no matter how the boat heels. Other benefits include reduced pitch and increased effective waterline. And one happy benefit is that the twin rudder design also creates a space in the transom large enough to stow the dinghy. It’s called the garage. It works! This design is proven on some amazing blue water boats including the Boreal 44. It is very effective. Comprehensive electrical charging system with a massive battery bank charged shore power North America and Europe, main engines high output alternators, Fisher Panda generator, and solar panels. The design of the electrical system incorporates the massive capacity of the high output 320 amp alternators to charge a huge battery bank with both a 12volt system and a 24volt system as all large yachts do. There is a total of 2450 amp hours of battery storage capacity in the keel which is huge. Electrical system is designed to be at home in the North America and in Europe so that you can plug in with 110 volt 30 amp shore power or plug into European shore power with 220 volts 60 htz 230 volt 50 htz. 12 Volt system, One piece 90 Ah battery, for generator start. Plus one Victron Skylla 230 Volt to 24 Volt – 90 Amperes. The Paradise 60 is designed with the ease of handling for two people as the foremost requirement. 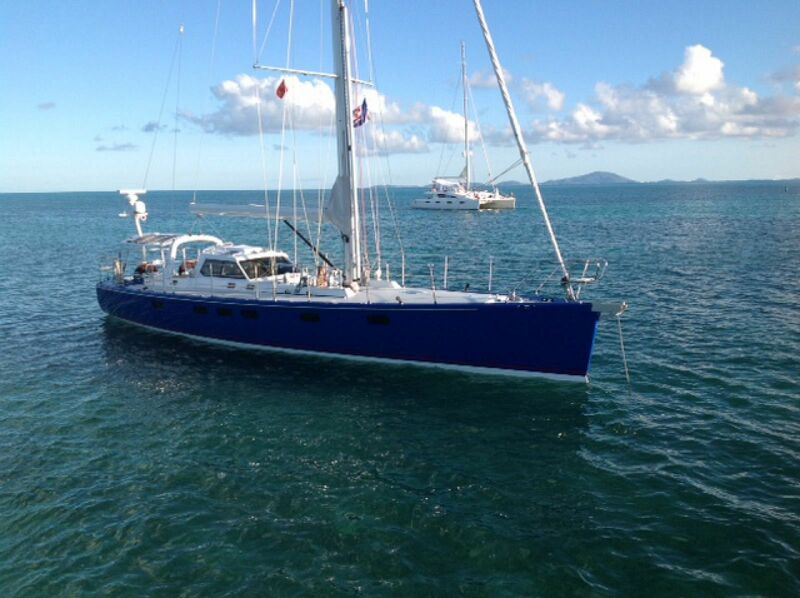 With the hull easily driven the rig is relatively short with a small for triangle and a powerful full batten main sail. The carbon fiber mast made by Hall Spars & Rigging has three spreaders swept back 21 degrees. The chain plates are outboard at hull sides with the lower shrouds placed inboard for a beautiful clear side deck from bow to stern. And all the sail handling is accomplished with the push of a button. The mainsail is fully battened and using a hydraulic furlboom and hydraulic winches it is a simple thing to raise the main. The genoa is installed on a Reckmann RF90 RF 90 hydraulic genoa furler so furling the headsail is easy. The inner forestay is Kevlar with a removable Karver furler. The sail area is 1576 sq ft including the mainsail and the #3 genoa. Morning Star was designed to be easy to sail, easy to motor, and to be very efficient. The hull shape is modern and easily driven with the ballast and the sail area nicely balanced. The proportions are just right with a length of just over 60 feet on deck with 58 feet of waterline which is amazing. The beam at 15.6 feet gives her space and stability. The draft of 7’6” gives this swift sloop at ability to go to weather neatly. Displacement of 26 tons makes her weigh in at about 52,000 lbs dry for a comfortable ride.